Save emails to PDF is simple to use. Installing the extension adds a "Download to PDF" button on the Gmail toolbar. Select whatever files you’d like to save, choose your preferred export format, and it arrives as a download in a few seconds. The system even works with attachments. If the email contains a bunch of images, they’re embedded inline in the PDF; other formats are saved in an Attachments Zip file. Setting this up requires creating a free cloudHQ account. The basic version also limits you to a maximum of 50 conversions a month. A Premium version gets you unlimited phone and email support and unlimited conversions for $49 per year. 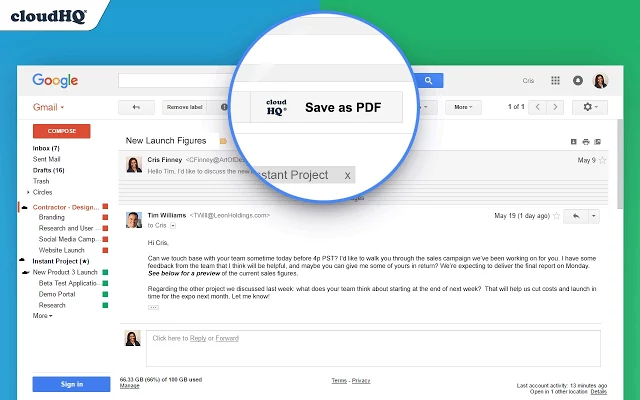 Save emails to PDF is a free extension for Google Chrome.